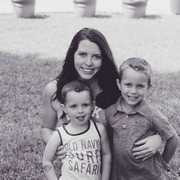 I am a stay at home mother to 2 boys ages 3 and 5. I am also studying to be a Registered Nurse and will be starting the program at Tyler Junior College this fall. I am looking to provide care to a few children along with my own this summer to help with the cost of my tuition. I am BLS and CPR certified. Before I had children I volunteered at the church nursery and was also the oldest sister to 5 siblings. Karli doesn't have any reviews yet.